Bendt is an elderly cook working the kitchen in the basement of the Bards College. He is not particularly fond of people entering his premises, which might explain why the majority of students enjoy their meals at the local tavern instead. He lives a secluded life in the kitchen area of the college. Like the students, he wakes up early at 4am then spends the entire day in the kitchen, where he either cooks, eats, or wanders around. At 10pm he enters his private quarters and goes to bed. The only exception to this routine occurs at the end of Tending the Flames when he will set up a small stand in the courtyard outside the college, celebrating the annual Burning of King Olaf festival. He wears a chef's tunic with a matching hat and a pair of shoes. He only carries an iron dagger and the key to Evette San's house (see bugs). 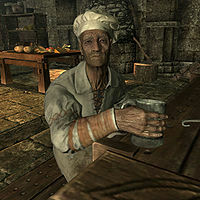 When approached in his kitchen, he makes it quite clear that you are not welcome, saying: "You've found the Bards College kitchen. Congratulations. ", "Meals are served to Bards at designated times. Find an inn if you want to make requests." and "You look a little sturdier than most of the Popinjays around here." During the Festival, he will be a bit more polite, shouting: "Candy! Get your King Olaf's Festival candy!" and "Tasty, sugary treats!" If you approach him, he will offer you his treats with: "You might as well have some sweets. I made them for the festival after all." Bendt was mistakenly given the key to Evette San's house, despite having no relations with her at all. This page was last modified on 24 September 2017, at 21:14.